Belton House is a 17th Century Grade 1 listed country house in Lincolnshire. 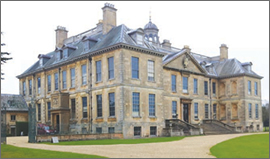 The project involved the conversion of an existing unused building in the grounds of the National Trust property. 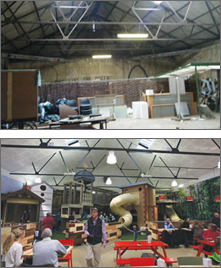 The works included alterations and refurbishment of the existing gift shop, creation of new visitor facilities and the conversion of the former Ride into visitor catering provision. As a non profit distributing organisation, NHBC worked harmoniously with The National Trust and understands the Trust's aims of conservation and protection. NHBC Building Control was proactive and provided a quick response to queries from the architect. NHBC attended site regularly and was available at short notice to avoid any delays on site during the tight 16 week programme. NHBC Building Control were appointed as Approved Inspector 12 months before any work started on site and were actively involved in design team meetings to ensure the plans met with Building Regulation requirements and also adhered to stringent National Trust conversion requirements. Early discussions with the National Trust and their design team enabled issues such as means of escape, Part L and Part M Access, to be resolved right from the initial planning stages. Consideration had to be given to providing adequate means of escape, NHBC worked with the design team to ensure that the correct number of correctly sized fire exits were provided within the confines of the existing fabric. Linking two existing buildings with differing heights involved overcoming accessibility issues. NHBC worked collaboratively with the designers to ensure compliance with Part M was achieved. Belton House remained open to the public throughout the construction period. For more information or technical support, you can give us a call or send us an email. All the Approved Documents for England and Wales plus latest news and guidance.